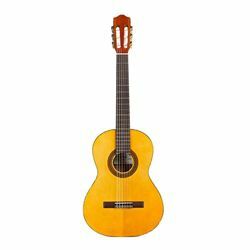 The C1 3/4 is a smaller body size nylon string Spanish style guitar featuring a 615mm or 24.2" scale length (3/4 size). It belongs to the Protg by Cordoba line, a series of high quality instruments created to provide aspiring young guitarists with a comfortable first guitar that's easy to learn on and play. Offered in full, half, three quarter, and one quarter sizes, the Protg by Cordoba models feature the classic combination spruce tops with mahogany back and sides, rosewood bridges, rosewood fingerboards, a Hauser style wood inlaid mosaic rosette, nickel tuning machines, premium Savarez strings, and a high gloss polyurethane finish. All Protg by Cordoba guitars also include a two way truss rod and a Cordoba gig bag.